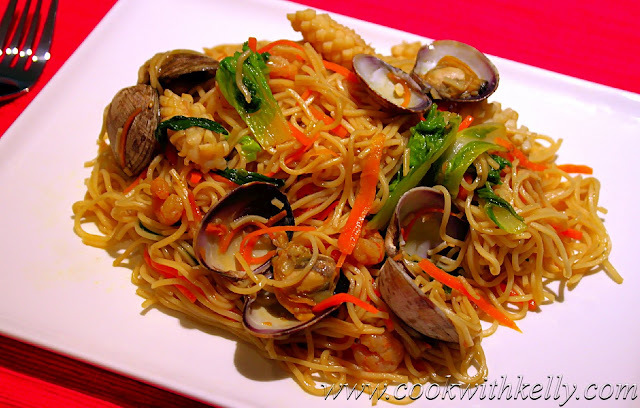 There are a lot of Chinese restaurants that serve Seafood Fried Noodles on their menu. 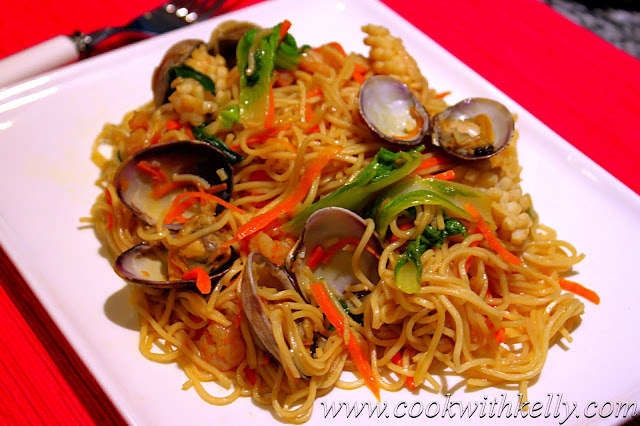 Unlike my other dish - Clam and Mussel Fried Noodles, I found this recipe in a Taiwanese cook book but I changed it slightly by adding a wider variety of vegetables and seafood. It tasted so yummy! The julienned carrots give an extra texture and the clams give an oceany flavour to the noodles. I also added a cup of chicken stock to cook with the noodles so the noodles don't require a lot of oil to cook. The chicken stock goes great with seafood, and it's healthier. I bought the pre-cut squid from a local Chinese supermarket. If you can't find it, the preparation is fairly easy. Julienne the carrot, cut the green onion approximately an inch and a half long. Mix all the frying sauce in a bowl. Pare and clean the squid, cut light crosses on it and slice it (you can also buy pre-cut squid from any Chinese supermarket). Bring half a medium pot of water to a boil. When the water is boiled add noodles to the boiling water and cook for 1 minute. Transfer to a colander, rinse with cold water and drain the water. Add 1 tbsp olive oil to the noodles, and mix evenly. Bring half a medium pot of water to a boil. Blanche clams, shrimps and squid into the boiling water until they are open. Transfer to a plate. In a nonstick medium saucepan or a wok, heat 1½ tbsp olive oil over medium-high heat. Add green onion, carrot and Chinese lettuce to cook. After about 2 minutes, when the lettuce is tender and soft add clams, shrimps and squid. Stir everything evenly and then add the frying sauce. Mix everything evenly, add the noodles. Stir everything for a couple of minutes, add 1 cup of chicken stock. Mix everything evenly and keep stirring everything for a few minutes. Transfer the noodles to servering plates, enjoy! The noodle looks very delicious with the generous seafood topping. Yummy! I am not fan of Clams and Mussels, but my husband is very much so into all sea food..this looks wonderful KElly, very appealing! Thanks Kelly for sharing a delicious recipe.. I will definitely try this.. I am sure it would be tasty.